As long as you don’t have an own car you have to use public transport, like buses or tramways. There are a few rules you probably should know and remember. Very well then! 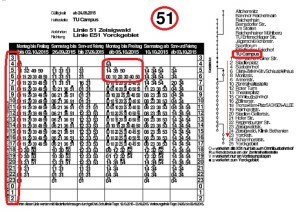 How do I take the bus in Chemnitz – and actually everywhere else in Germany? First of all, you should remember to enter the bus at the front and to show your ticket to the bus driver. In this way, the bus driver insures himself that no one is taking the bus illegally (or as we say in Germany “schwarz fahren”, which can be translated to “taking the bus black”). If you have to run to catch the bus, it is okay to enter the bus at another door than the first one. And if you have bulky things with you, like a buggy or a wheelchair, it is also okay to enter the bus at the middle door. Nevertheless, you should always try to enter the bus at the front and to show your valid ticket. Of course it is also allowed to leave the bus – at every door except the first one. That’s why we have these barriers which only can be pushed into one direction. If you’re looking for a seat, there are also a few things to remember. Even when we take the bus or tram, Germans can be very distant and reserved. If someone sits down at a window seat, it is okay to take a seat next to them. But sometimes, people sit down at the aisle seat or block the other free seat with a bag. That’s not very polite but sometimes people just want to have a bit free space. Maybe they are sad? Or they have sorrows? Or they are ill and don’t want to infect someone else? You can’t know and therefore, you should respect their need for free space. Even if the bus is mercilessly jam-packed and there are too many people in one bus, you should try not to touch anyone as far as possible. Germans just don’t like to be touched by unknown people. Let’s call it the “German Distance Rule”. By the way, even in very crowded buses it is forbidden to stand next to the bus driver. It is just allowed to stand behind the barriers. This is due to safety rules – and actually good for the bus driver, so he can see his right rear-view mirror. Please note to keep the yellow strip clear which is drawn on the ground next to the doors. Otherwise, the doors can’t be closed. If you notice that the door doesn’t close, take a step backwards – even if the bus is mercilessly jam-packed. Every seat should be offered to an old or otherwise needy person, like children, pregnant women or handicapped people. And if you see someone stumbling into the bus with his crutches, you should probably offer him your seat, too. It will be thanked a hundred times. The area in the middle of the bus is reserved for wheelchairs and buggies. So if you see someone who tries to enter the bus with a wheelchair or buggy, you should take a step sideward. And of course you can offer your help to get the heavy thing into the bus – it will be thanked, too. Sometimes, tickets are checked in the bus or tram by two or more people. They don’t wear a special clothing but have an ID which allows them to control your ticket. Sometimes, they don’t seem to be very nice but mostly, they are friendly. It is incredibly important to have a valid ticket with you. Otherwise it can be very expensive – for every invalid ticket you have to pay 60 €. But when does my bus or tram arrive? You can check it at every bus stop. Either it is written on the post with the huge green-yellow “H” or you can find it on the board at the roofed area. In huge letters the bus or tram number is written at the top of the plan. 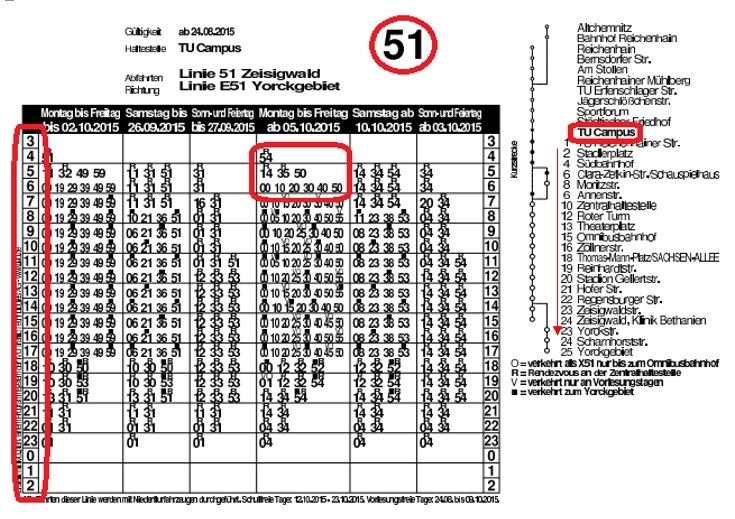 On the left side you can find the full hours and behind them the minutes on which the bus or tram arrives. Here in Chemnitz, we have an easy rule. Buses with a “1” as the second number (21, 31, 51) arrive every 10 minutes. Buses with a “2” as the second number (22, 32, 62, 72) arrive every 20 minutes and buses with a “3” as the second number (23, 43, 63) arrive every 30 minutes. You can also check the departure times on “www.cvag.de” (the website is available in German, English and French). Here you can find the network of Chemnitz buses and tramways. In the picture you can see the bus number as headline (here: 51). On the left side you can find the full hours and in the middle the minutes of departure. On the right side stands where you are (here: TU Campus) and in which direction you are heading – on the plan always downwards (note the arrow). Please remember that these plans can vary depending on the time of the year (like on holidays, vacation or weekends). Germans emphasise politeness and good manners. Therefore it is very important to know some polite expressions and how to greet other people. There are a few forms of greetings. The usage depends on how good you know the other person and how many people there are. If you are in the city and there are a lot of people, you don’t greet them directly. Nevertheless, a nice smile is always good. If you meet a single person on the street you nod and say “Guten Tag” (“Good day”). If you have an appointment with another person, you always greet. Here, it also depends on how good you know your counterpart. If the meeting is official (e.g. with an agency), you greet the other person with a handshake. If you meet your friends, you often hug him or her. In any case: The more you know a person, the casual the greeting. Remember to say “Guten Tag” (“Good day”) to people you don’t know or “Hallo” (“Hello”) to friends. If you meet a person without an appointment (e.g. a salesperson at the supermarket or a policeman on the street), you just say “Guten Tag” or “Hallo” without a handshake. Germans are rather distant and reserved. If you are not sure how to greet your counterpart, you should use the handshake. It is also important to pay attention to the reaction of the other person. By the way, the leave-taking is very similar to the greeting. Here, you also use a handshake (if you don’t know the person very well) or a hug (if he or she is your friend). In addition you say “Auf Wiedersehen” (official and formal) or “Tschüss” (friends). Here’s another tip: If you want to be extra polite, you can say “Danke für das Gespräch”(“Thanks for the talk”). Remember: Germans really attach importance to politeness and good manners. Also the personal distance and free space are very important. The distance between two people should reach one arm’s length to your counterpart. There are a lot of expressions to show politeness, like “Danke” (“Thank you”), “Bitte” (“Please”), “Entschuldigung” (“Sorry” or “Excuse me”), “Guten Tag” (“Good day”) or “Auf Wiedersehen” (“Goodbye”). This word is used very often. For example, we say it, if we get something from someone else. So if a salesperson at the supermarket gives the articles or change to you, you say “Danke”. We also use it if someone opens a door for us or offers us a seat. Overall we always say “Danke”, if someone is nice and polite to us or gives something to us. “Bitte” is also a very important expression in Germany. We use it if we want something from someone else. Therefore, if we want someone to give something to us, we say “Bitte”. By the way, the best way to react to a “Bitte” is a “Danke” from your counterpart. A very special use of “Bitte” is, if you give something to someone. In this situation you say „Hier bitte“ („Here we go“). If you help someone and he or she says “Danke”, you can reply with “Bitte” or “Gerne” in order to express that it was a pleasure for you to help (like “You’re welcome”). We always say “Entschuldigung”, if we harm someone (and it doesn’t matter how great the harm was or if it happened on purpose). So if you bump into someone, you should say “Entschuldigung”. If you don’t understand what your counterpart is saying, you also use “Entschuldigung” and ask the other person to repeat what he or she said. If you ask an unknown person the way or another question, the first expression is “Entschuldigung” (like “Excuse me”). Sometimes you can use “Entschuldigung”, if someone bumps into you. Even if you are the harmed person, “Entschuldigung” can prevent a conflict. These expressions can magically conjure a smile on the face of a German. So they are as important for everyday life as the other expressions. They are the framework for every conversation. For every expression you should remember to use them as much as possible. As you have heard many times, Germans emphasise politeness and good manners. If you use these words correctly, a good atmosphere and comfortable conversation is possible. Thanks for reading the article and Goodbye. Or as we say in Germay: Danke, dass Sie den Artikel gelesen haben und Auf Wiedersehen. The constitution of Germany was written in 1949 and stands above all other laws. The articles 1 to 20 can’t be changed or rewritten. Here you can find the most important articles from the constitution. All of these rights are not only for grown-ups but also for children. Article 1 is perhaps one of the most important laws in Germany. It says that the dignity of all humans is inviolable and can’t be touched. It is the duty of all public authorities to protect and respect it. Every human has the right of free development of one’s personality. Furthermore, everyone has the right to live, physical inviolability and personal freedom. Therefore, it is not allowed to hit or harm children. No one is allowed to harm you in any way. It is allowed to limit the law of freedom, for example when you have committed a crime. But nevertheless, your dignity and personality have to be saved in any case. Dishonourable treatment like hits or torture are always forbidden. All people are equal before the law. It is not allowed to discriminate someone because of his origin, skin colour, language, religion or gender. Men and women are equal in every way. Women can do everything a man is allowed to do, like working, voting or driving a car. Every person in Germany is allowed to choose his or her religion freely. There is no state religion. The unhindered practice of one’s religion has to be warranted. For example, it has to be warranted for a Muslim to pray five times per day. Religious signs like a Christian cross are allowed to be worn in public. It is not allowed to discriminate someone because of his or her religion. Every human has the right to show and spread one’s opinion in speech, text or picture. The freedom of press is one of the most important laws in Germany. For example, there are no state-run television or radio channels. The freedom of opinion can be limited to protect the safety or public policy. It is forbidden to harm or discriminate someone with one’s freedom of opinion. Art, science, research and teaching are free, too. Marriage and family are under special protection of the state. To educate one’s own children is the natural right of the parents. It is not allowed to take a child out of its family, but for the safety of the child (for example if it is beaten or harmed in another way). Every mother has the right of protection and care of the community. Illegitimate children have the same rights as legitimate ones. The school is under the state’s protection. Therefore, the school subjects or curricula are specified by the state. In every school there is the subject ‘religious education’. Parents are allowed to choose whether their child should take part of religious education or not. Hence, no child can be forced to be taught in this subject by the state. That’s one important part of the freedom of religion. All Germans have the right to free and peaceful assembly without weapons. This right can be limited, for example to protect the public policy or safety. In Germany we have the secrecy of post. Therefore, no letters or packages can be opened by the state or police. Conversations are also protected. No one is allowed to listen to your talks. This right can be limited to protect the democracy, public policy or safety in Germany. Every German has the right to choose one’s job, apprenticeship or workplace. No one can be forced to do a special working. Everyone is allowed to write a petition or complaint alone or in a group. This petition or complaint can be addressed to the appropriate authorities or representation of the people, like the government or other representatives. If someone misapplies his rights against the free democratic basic order, like the freedom of speech or assembly, these rights can be denied. For example, if someone organizes assemblies to agitate against other people (e.g. because of their skin colour or religion), he or she can lose his or her right to assembly. The limitation of every freedom and right is the democracy and safety and freedom of other people.